South African Caster Semenya, winner of the women’s 800m at the 2009 world track and field championships, is still awaiting her gender test from the IAAF. Although the test results are not in, the IAAF has announced that they will pay for any surgery Semenya may need to officially become female. This could lead one to believe that the tests will in fact show she has male parts and will need surgery if she wants to continue competing as a woman. 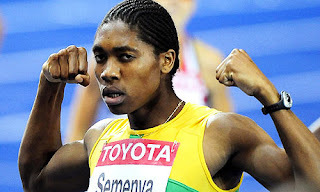 The track and field governing body requested the test amidst speculation that Semenya may be genetically a male.